The Davis family story continued in 2017 with another great year fully of many proud moments. 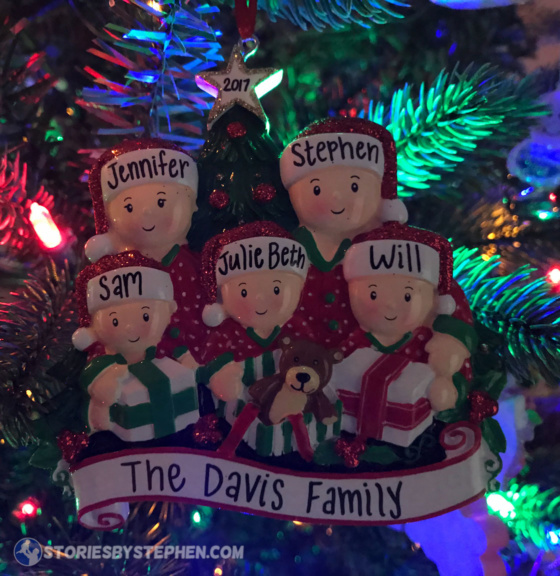 CLICK HERE TO READ MY FULL POST, WHICH TELLS OUR ENTIRE FAMILY STORY TOLD WITH CHRISTMAS ORNAMENTS YEAR BY YEAR FOR THE PAST 11 YEARS. Jennifer continued running this year trained hard this fall. She ran her first (and only, according to her) marathon in December at the Rocket City Marathon in Huntsville, AL. She says she will never do it again! Even so, I am extremely proud of my runner wife and her accomplishments, and she says she will still run half-marathons and shorter distances in the future. I did not run the marathon with her like I had originally intended. I trained for awhile and even built up to a 20-mile long run. If the marathon had been that day I could have finished it, but unfortunately I had Achilles tendonitis that just would not go away. So I stopped training a few weeks before the marathon to let my Achilles heal. Now that I am nearly recovered, I plan to take on some new endurance challenges next year. I was just gifted a nice road bike, and I hope to test the triathlon waters in 2018. I am not sure if an Ironman will ever be in my future, but I want to try some sprint and olympic distance triathlons and see how it goes. Jennifer is still working for her stepdad’s insurance agency, and while not much changed for her in 2017, she is about to start studying to get licensed in health insurance. This will change her role with the agency, and it will be interesting to see where that goes next year. I have continued to grow my eBay home business that I started 16 months ago, which allows me the scheduling freedom of a stay-at-home parent during the summer and holidays. Hopefully my profits will keep increasing so I don’t have to get a job working for someone else next year! It is not what I expected to be doing, but I love the freedom of being my own boss and making my own schedule. I also like finding rare items and reselling them for huge profits. Unfortunately I have to look through a ton of cheap junk to find the good stuff, but I enjoy the hunt. My family back in Memphis had some rough moments this year. First my parents’ house (my childhood home) caught on fire in the middle of the night in August. They barely woke up and escaped before their room was engulfed in flames, as the fire started in my dad’s closet just feet from their bed. Pretty much everything inside the house was destroyed, and I went back to help them sort through their belongings for a couple days after the fire. I had to wear a face mask the whole time, and the lingering smell of smoke was suffocating. I still cannot get the black out of the shoes I wore in the burnt house. My parents have been living in an apartment the last few months while they rebuild their house, and hopefully they will have a house again by summer 2018. Then my Dad’s mom (Grandma) passed away in November. She was my last living grandparent. While we were obviously sad to see her pass, we also felt a sense of relief for her because she had been in constant physical pain for the last decade. We all went to Memphis for the funeral. My sisters and I all spoke at the funeral, and I led the graveside service. This was the 1st time I’ve ever had to speak at a funeral, but it was a nice way to reflect upon all the great memories I had with my grandparents when I was younger. It gave me an excuse to talk about my love of all things Memphis Tigers in front of an audience because my Tigers fandom is rooted in my relationship with my grandparents. They had season tickets for Memphis Tigers football and basketball for about 30 years, and they took me to tons of games when I was a kid. As I continue to try and let my kids see and explore the true beauty of God’s creation, I took the kids on 2 camping trips in 2017. First we went to Cloudland Canyon State Park in North Georgia. This was my first camping trip to Georgia, and it was an incredibly beautiful park with some great hiking trails. This summer we spent a few days at Fall Creek Falls State Park in East Tennessee. This was the 2nd time my kids have been there, and it is my all-time favorite park in the country. I went there countless times as a kid and in college with my friends. Hopefully in 2018 we will find some new parks to explore! Jennifer and I had a very special trip this summer as we celebrated our 10 year wedding anniversary! We stayed at the Westin Resort on Hilton Head Island in South Carolina. This was the first time we have been on a beach trip with just the 2 of us since our honeymoon. The last 10 years have been better than I could have possibly imagined, and I love Jennifer more now than ever before. God is good! Life has been busier than ever for us this year. During soccer season when all 3 kids were playing on 3 different teams, we usually had soccer on Monday, Tuesday, Thursday and Saturday (oftentimes having 3 different practices on the same days). When you add in church on Sunday and Wednesday we would be lucky to ever have a day or night free. Sam started Kindergarten in 2017, and it is amazing how much he has grown up this year. His Christmas ornament is a basketball player because this is his first year playing basketball, which he has been excited about for months. Sam got a double dose of introverted from Jennifer and I, and he is definitely the most shy of our 3 kids. It takes him a very long time to warm-up to his teachers at school and church, but he has started to slowly come out of his shell this year, particularly with other kids. He loves to constantly talk about all the friends he has made here, and at home his mouth never stops going. Not only does Sam have lots of friends at school, but he is doing a great job as a student too. He especially loves math, and he is constantly asking me the answers to addition problems so he can memorize the answers. Sam has really gotten into sports in 2017. He played soccer for the 2nd time, and he had a fantastic season. I coached his U6 team again, and since I also coached Julie Beth’s U8 soccer team, Sam participated in all of the U6 and U8 practices. Practicing with the older age group paid off big time, and Sam usually scored between 5-8 goals in every U6 soccer game. I was one proud coach and dad! 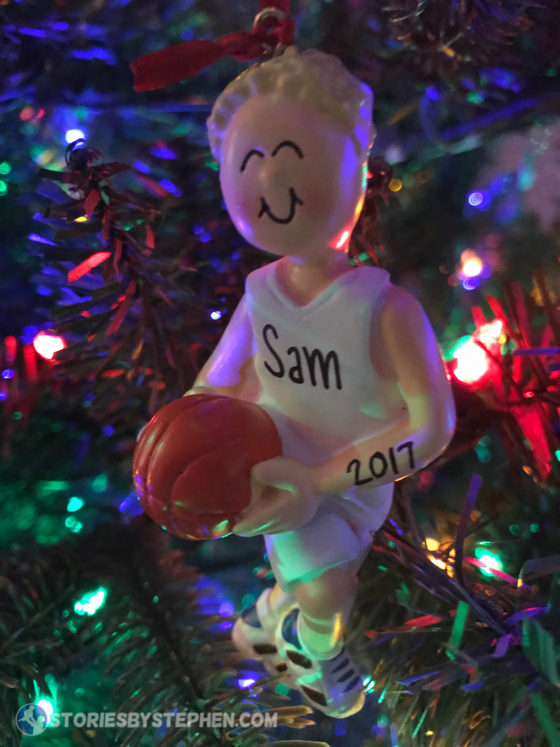 As you can tell from his 2017 Christmas ornament, Sam’s new sport this year was basketball. He loves playing soccer, but he has also been talking about playing basketball for the past year. He has been practicing dribbling and shooting on our driveway with Will for months, and he was beyond excited to go to his first real basketball practice. He plays in the 5-6 year olds league, and most of the kids on his team (and the opposing teams) are a head taller than him. He does a great job of dribbling the ball down the court and passing it off to a teammate, but he has not quite figured out how to sort his way through the mob of kids towering over him and get close enough to the goal to take a shot. Maybe next year when he is taller he will have a better chance at making some shots. Just like his big brother, Sam’s favorite basketball player is Steph Curry, and he loves his all his new Under Armour Steph Curry apparel he got for Christmas, especially his shoes . Since Sam was 8 months old, both boys have always shared a bedroom. In 2017 we decided it was time to let them each have their own bedrooms, so we gave up our playroom and let the boys each have their own space. Sam was very sad at first to not be with his big brother anymore, but when he found out that 90% of the toys from the playroom would be in his bedroom he got really excited. Some of Sam’s favorites this year include all the Pokemon shows and video games , Roblox , Minecraft , Transformers , Dragons Race to the Edge , Pirates of the Caribbean , Legos and Skylanders . Julie Beth finished Kindergarten in the spring and started 1st grade in fall 2017. Her Christmas ornament is a girl with braces because she got braces this year (only on 4 teeth). In 2017 Julie Beth continued doing gymnastics, and she played soccer again this fall. I coached her U8 team, and she did an awesome job, scoring several goals and playing tough defense. It is the only sport with a ball that she cares about, and she has no desire to play basketball like her brothers. While Will is average height, and Sam is very short for his age, Julie Beth was in the 75th percentile for height and 90% percentile for weight at her annual check-up this fall! I am not sure where she gets the height, since Jennifer and I both come from short families, but she is taller than most of the kids her age. 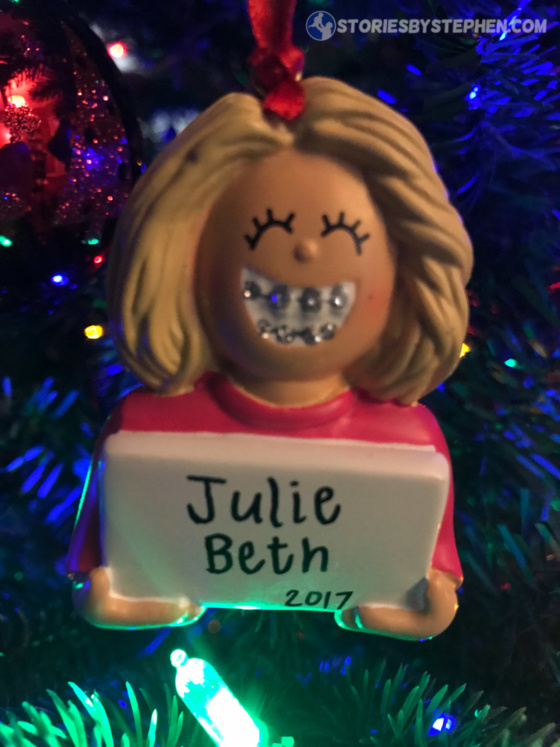 One big change for Julie Beth this year was her braces. One of her front teeth was growing in at a bad angle behind her bottom teeth and much further back than her other front tooth, so the orthodontist wanted to straighten it out before the rest of her grown-up teeth came in. She only got 4 brackets, and they are being removed next month. It only cost a couple hundred dollars for the 4 brackets, but we had the eye-opening news of how much the full braces will cost. Multiply that cost by 3 kids, and then I can choose between buying a brand new car or giving all my kids straight smiles. We are not looking forward to that expense over the next few years! Julie Beth has continued to go to speech therapy at school this year, and her speech has come so far over the last couple years. She is also a great student at school, and she can read really well for her age. Some of Julie Beth’s favorites this year include everything JoJo Siwa , anything covered with magic sequins , gymnastics equipment (She and Sam love making his bedroom into a gymnastics room. ), Liv and Maddie tv show, Full House / Fuller House , and she even got into Pokemon 3DS games like her brothers. Will finished 2nd grade this year and got to move up to a new school for 3rd grade. Spring 2017 was the last time that all 3 kids would be together at the same school until Will is a senior in high school. Nonetheless he loved moving up to be in school with the older kids. 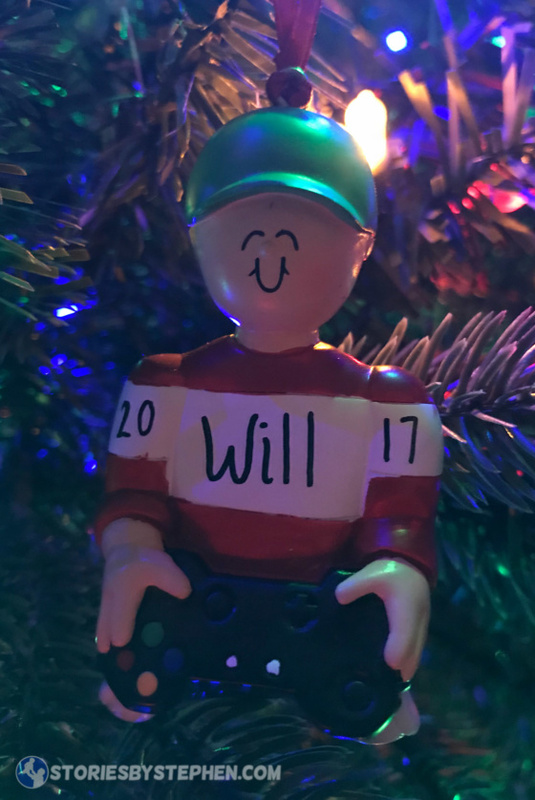 Will’s Christmas ornament is a boy playing Xbox because that is Will’s favorite way to relax at home when he actually has some free time. Will had a big year in 2017. We are very proud of how he has excelled at school and sports. At his new elementary school (for grades 3-5), he recently got 8th place at the school Spelling Bee and beat most of the older kids in his school. He also got an award for having the most AR (Accelerated Reader) points in the entire school. He got so many points because he read all 7 Harry Potter books by Thanksgiving of his 3rd grade year. This was a really fun thing at our house because every time he finished a book we would watch the next movie as a family. After reading all the Harry Potter books he tested at a grade 7.8 reading level. Will also got invited to be in the gifted student program at school, which he loves because they get to learn how to use 3D printers, build things and solve complex programs in groups. Will continued to play soccer and basketball this year, taking on new opportunities and challenges in each sport. He is currently playing his 2nd season with a travel basketball team, and we really appreciate the kind of coaching he gets with this program. It is really amazing to watch how much his skill level has improved since a year ago. He also has some great friends on his team, and all the families spend a lot of time at the basketball courts together. In spring 2017 Will joined a travel soccer team that was newly formed. Will started playing up to the U10 age group in soccer when he was still 7 years old, and the travel team he joined at 8 years old was a U12 team. Not only are his teammates mostly much older than him, but in the spring they practiced with a U14 soccer team ever week. He was a 2nd grader practicing with 7th graders! He played on the team again this fall, but now his team practices by themselves, which is much better for Will. Soccer season was a bit rough as the team did not win much, but all the parents were very proud of how hard the boys battled throughout the season. They were a first year team playing in the Division 2 State League against teams that had been playing together for 3-4 years. Will also has some great friends on his soccer team, while Jennifer and I have started getting to know the other parents well too because we spend so much time together at games and tournaments. Soccer and basketball keep Will very busy, but he did find time to run two 5K races with me this year, winning his age group in his 1st ever 5K race. Some of Will’s favorites this year include playing Xbox One (NBA 2K18 is his favorite game. ), Beyblade Burst shows and toys, Pokemon shows and 3DS games , anything Golden State Warriors (particularly Steph Curry & Kevin Durant ), Steph Curry basketball shoes and tall basketball socks . All in all God has been very good to my family once again in 2017, and we look forward to seeing what adventures He has in store for the Davis family story in 2018! CLICK HERE TO READ MY FULL POST, WHICH TELLS OUR ENTIRE FAMILY STORY TOLD WITH CHRISTMAS ORNAMENTS YEAR BY YEAR.